Fecheng got time record 1.03 ” 4/5 about 1,100 meters. picture from magazine La Fija. The Peruvian Facheng achieved one more an impressive feat on the Miguel Salem Dibo racetrack, on Sunday he won his second consecutive victory in the sixth race of the equestrian day, and brought his owner Alvaro Noboa and his wife Anabella to the winner’s circle. 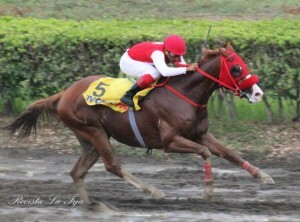 Facheng remained unbeaten, in a dramatically way, because he had to struggle hard under the direction of the Ecuadorian jockey Jose Jurado, and confront Polvo de Estrelleas (Stardust for its English name), which he could virtually defeat in the same aim, due to a fault of Ojo Mágico (Magic Eye). Finally, Facheng imposed by an advantage of a head over his rival.